Labor day aka the last day you can officially wear white or so they say. Personally I've never believed in that rule especially because I'm a big fan of the color white. Fashion has no rules so wear what you want! I wore this look a couple weeks ago but kept forgetting to post it and coincidentally I end up posting it on Labor Day haha. I bought this white H&M skirt on sale for $30 in July and originally wanted to wear it for Her Conference. Then at the last minute I changed my mind once I found this grid dress. Depending on the style of the midi skirt, a lot of them can end up looking too fancy but this one you can wear for a lot of different occasions. It's so much more gorgeous in real life and it actually has a floral detail on it that's subtle but still gives it a little something. Oh and did I mention it has pockets? 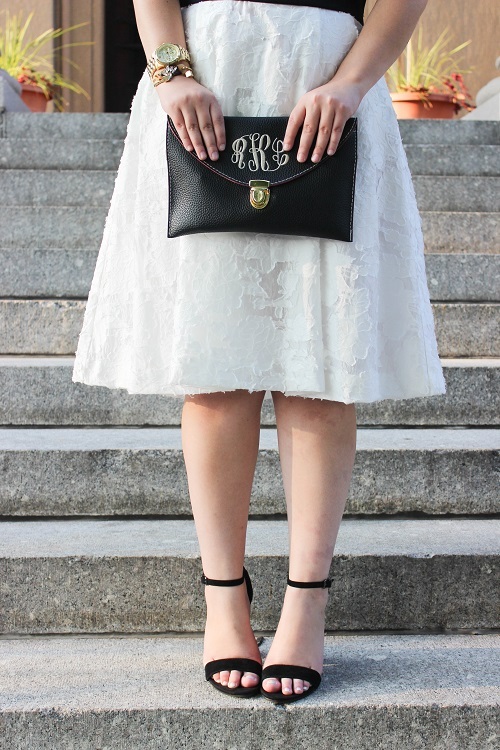 It's perfect paired with a simple black scuba crop top and these heels which are probably the most comfortable heels I own! Wow....Nordstrom Rack is open in Buffalo?! That's good to know! I like to go shopping in Buffalo because I live in the Toronto area...and you must know that us Canadian love our cross-border shopping. Loving the skirt so much! I think the white after labour day thing is a bit old-fashioned, especially when white is such a fun look to rock. 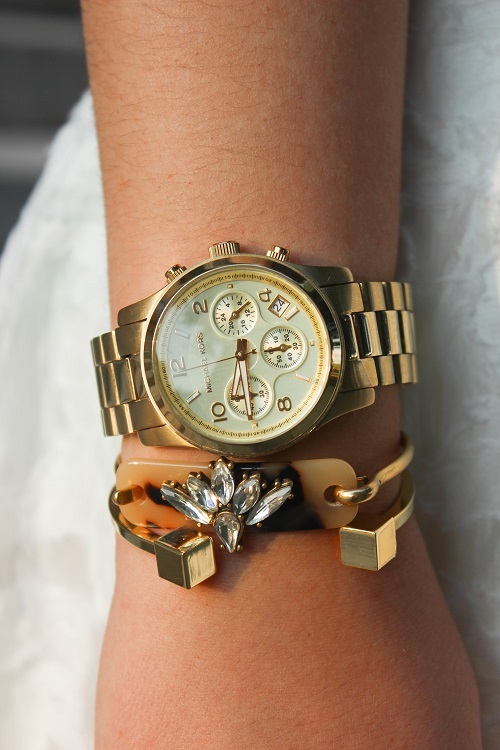 Cute look! 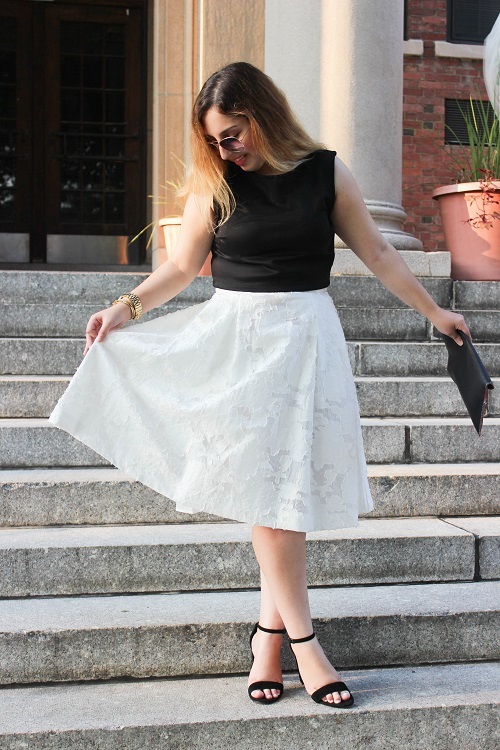 I'm so obsessed with midi skirts and I love your white lace! This is such a chic, black and white look. 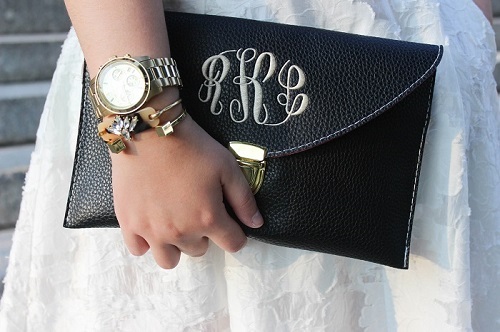 And omg, I love that monogrammed clutch!